What’s great about NASCAR in comparison to other sporting events is the amount of exposure you are able to get. Fans arrive to events up to five days before the actual race. This gives you access to a huge audience not only on the day of the main event, but also in the days leading up. If a weekend race has an attendance of 160,000 people, there are going to be at least 100,000 people in the days leading up to it that will see your aerial banner. It is quite uncommon to have such a captive audience concentrated in a concentrated area at the same time. Races act as an ideal setting and seem like a “no brainer” venue when trying to target the male population. 84% of consumers recall aerial messaging at stadiums and 9 out of 10 stadium attendees recall seeing an aerial banner. Multiply those statistics by however many days in advance the fans go, and the recall rates are through the roof. 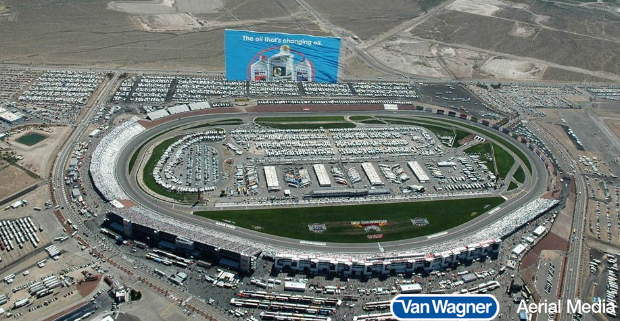 Aerial advertising is the only medium your customer and prospects can see no matter where they are at the track. It also doesn't have the price tag associated with event sponsorship, and transcends the large variety of ads in and around the stadium.Aerial advertising campaigns offer a great way to get your brand noticed by the male population, and there’s no shortage of ways to bring the added flair of aerial to your mix. If you would like assistance in targeting a certain demographic or identifying the perfect place to market your aerial advertisement, Van Wagner Aerial Media is here to help. We’re the largest and most experienced aerial advertising company in the world and there is no competition when it comes to creating breakthrough advertising campaigns. We tow banners, we fly blimps and airships … you name it! NASCAR is just one of the popular venues our banners fly over. Beaches, NFL games, state fairs, surfing competitions, and music festivals are all perfect platforms to execute an aerial campaign. Our team of skilled operators are standing by to answer your questions. Please feel free to contact us today. Or click below for a free quote.